See "County News" tab for Blanco County Spring Cleanup Event... COUNTY CLEANUP IS THIS SATURDAY, MARCH 27th from 8 am - 2 pm. ***** COUNTY CLEANUP IS THIS SATURDAY, MARCH 27th from 8 am - 2 pm. ***** COUNTY CLEANUP IS THIS SATURDAY, MARCH 27th from 8 am - 2 pm. This quaint little gem of a community is set in the beautiful Hill Country, of Central Texas. It is estimated to be 713.4 square miles and encompasses Blanco, Round Mountain, Hye and Johnson City. In 2014 the population was estimated to be about 10,812. The Visitors Center for this courthouse is open Monday through Saturday from 10 am to 4 pm, and Sunday from noon to 3 pm. Just north of the Blanco Courthouse, is yet another very historical courthouse seated in the heart of Johnson City and currently serves as the District and County courthouse for Blanco County. It dates back to 1916 and was designed by Architect, Henry T. Phelps. Its walls and body are made of stone in a very classic revival style. It is open to visitors daily during normal courthouse hours. 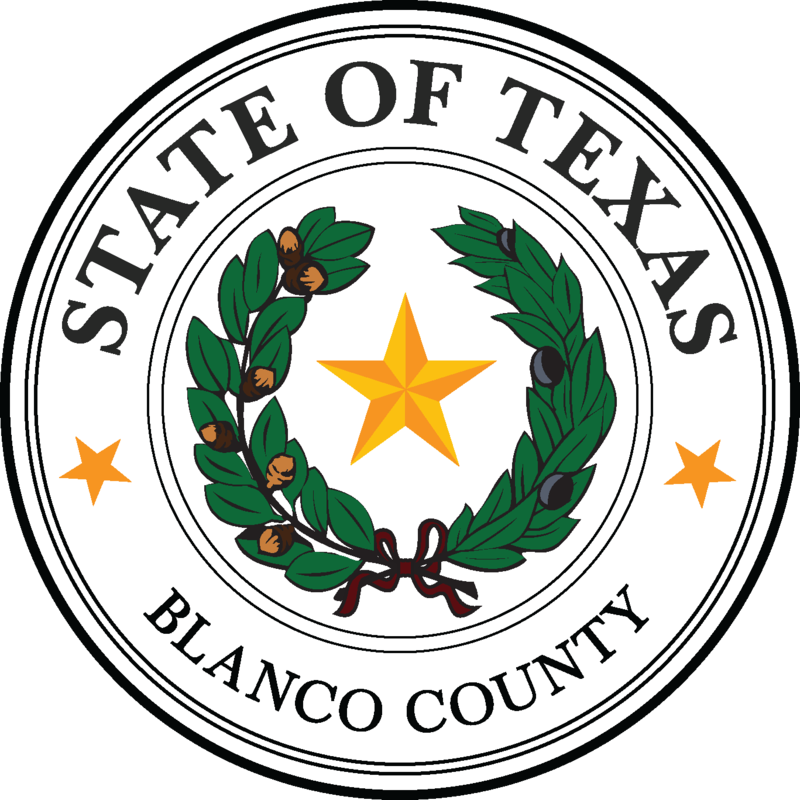 Monday-Friday, 8:00 a.m. to 4:30 p.m.
With its small County normality and friendly environment, Blanco County draws many visitors all year round. During our spring and summer seasons, one can enjoy camping, swimming, canoeing, kayaking or fishing along the banks of The Blanco River Park and The Pedernales River Park. One highlighted spring event is the Blanco Lavender Festival. The entire town of Blanco and the surrounding countryside will be bathed in lavender during this splendid Festival. The event draws many from near and far to enjoy the Lavender Market and allows visitors the opportunity to purchase many goods from our local vendors. Yet another focus is when our bountiful Bluebonnets and wildflowers emerge and burst into color in April. These brilliant colorful flowers can be seen lining meadows and streets throughout the county, creating the perfect backdrop for picture taking and outdoor picnics. Our winter season offers our extraordinary Courthouse Lighting in Blanco and Lights Spectacular in Johnson City during the Christmas Holiday season. Both Blanco and Johnson City courthouses can be seen draped in lights and the town squares surrounding them are fully lit with twinkling lights for the delight and pleasure of all who live here and those enjoying a respite visit from the hustle and bustle of the city. as LBJ’s Boyhood home for your enjoyment.